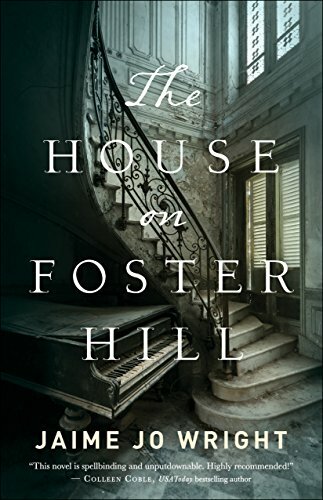 The House on Foster Hill (a novel) & A Giveaway! What a riveting novel! It’s written back and forth between current time and a century earlier – and it’s as mystifying in the current time as in the older time! Kaine Prescott and Ivy Thorpe are the main characters – both young women yet a century apart. The author jumps back and forth, telling a little of the story at a time in each time period – and I kept wanting her to stay at one mystery until I’d get wrapped up in the next/previous one. Kaine has just moved from San Diego to Wisconsin, hoping to leave behind the tragedy of her husband’s death (or murder) and begin anew by fixing up an old house in her grandfather’s hometown. One hundred years earlier Ivy lived in that small Wisconsin town and, after the discovery of a dead woman, seeks to uncover her mysteries. As the two young women, a century apart, begin to investigate, someone wants to stop them. But who or whom? And why? Is there a connection? And what other mysteries will they uncover as they dig up clues and unearth the family tree. I found this book quite suspenseful and kept wondering what would happen next – there were lots of twists! I received a copy of this book from the publisher. I am freely writing a review – all thoughts and opinions are my own. ***GIVEAWAY***: For a chance to win this book, please comment below and if you don’t already follow my blog, please sign up to do so! I’ll pick a winner on Jan 4! You’re in the drawing to get it!